CalDigit announced two Thunderbolt enclosures at NAB. We were able to test the single bay enclosure they call the "CalDigit T1." It came with the Intel 520 Series 6Gb/s SSD (480G) so we decided to compare its performance to other Thunderbolt enclosures with a 6Gb/s SSD as a way of comparing max real world throughput of each. We measured the transfer speed of small blocks (from 4K to 1024K) --- average of 5 runs. Test "mule" was the 'late 2011' MacBook Pro Quad-Core i7 running OS X Lion 10.7.3. We use the Custom Sequential Test with 1GB transfer size. We take the average of 5 test cycles. The CalDigit T1 single bay Thunderbolt enclosure delivers faster sequential READ speeds than other "purely" single bay Thunderbolt enclosures like the Seagate GoFlex and Elgato. However the sequential WRITE speeds were slower than the other two single bay Thunderbolt enclosures. Though the CalDigit T1 requires an AC adapter, it can handle both sync and async 6Gb/s SSDs as well as all types of SATA HDDs. The bus powered GoFlex and Elgato can only handle async 6Gb/s SSDs and 3Gb/s SSDs. The Promise Pegasus with the same single SSD as the CalDigit T1 was significantly faster on WRITE speed, but there is a catch. If we configured the SSD as "passthru," the write speeds were the same as the CalDigit. It was only when we configured it with the Promise Utility as a "faux stripe" that the write speeds jumped up. Reality check: the Promise Pegasus R4 is a RAID box designed for four HDDs. I doubt anyone will buy it just so they can use it for one SSD or HDD. 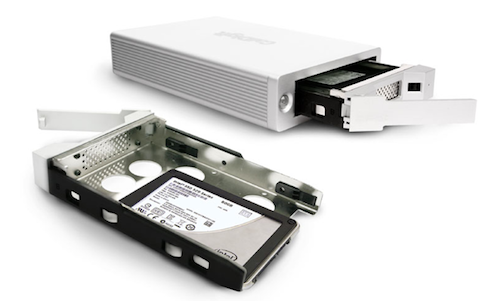 Forcing the LaCie Little Big Disk dual bay enclosure to run one drive revealed a weakness in that configuration. Even with a 6Gb/s SSD, it ran slower than the Elgato with a 3Gb/s SSD. Its forte is running with two SSDs in a stripe. In that configuration, it can achieve READ speeds over 500MB/s and WRITE speeds over 375MB/s. Though we didn't include HDDs in this test page, we did test the CalDigit T1 with two different HDDs. The WDC Velociraptor 1TB achieved 198MB/s READ speeds and the Seagate Barracuda 3TB achieved 180MB/s READ speeds. It's starting to get confusing when choosing a Thunderbolt enclosure but more choices are a good thing. The CalDigit T1 Thunderbolt enclosure offers some advantages over other single bay Thunderbolt enclosures. The drive mounting tray is removable so you can use any drive you prefer. Our test unit had two trays, one with mounting holes for 2.5" drives and one with mounting holes for 3.5" drives. Because it has an AC adapter, you avoid the drive restrictions of bus-powered Thunderbolt enclosures. There are two Thunderbolt ports so you can use it to daisy chain to another Thunderbolt device. The fan switch enables you to turn off the small cooling fan off it is not needed. And there's more. We mentioned there were two Thunderbolt enclosures announced by Caldigit at NAB. The second one is a dual bay enclosure, the CalDigit T2. We are looking forward to testing it to confirm the READ speed of 630MB/s when equipped with dual 6Gb/s SSDs. Watch for them to show up on the CalDigit Store as well as Caldigit dealers like Other World Computing and PowerMax.